Calcium aluminate powder is yellowish powder. The main components are monocalcium dialuminate (CaO·2Al2O3) and monocalcium aluminate (CaO·Al2O3). Slightly soluble in water, aqueous solution is alkaline (PH value is approximately 11). It can react with inorganic strong acid at ambient temperature and release a large amount of heat, the dissolution rate of aluminium oxide can be as high as 90%. It can be used as raw materials to produce liquid or solid polyaluminate chloride (PAC) which can simplify the process, reduce cost and improve the quality. The calcium aluminate powder is mainly used to produce aluminates like PAC, aluminium sulfate, and sodium aluminate. It can be also used to adjust the basicity or used as refractory material. The calcium aluminate powder is a special raw material for PAC （polyaluminium chloride）. The mixture of bauxite and limestone goes through crushing, drying, grinding, blank making, calcination and powder grinding to be calcium aluminate. The calcium aluminate powder is a special raw material for PAC （polyaluminium chloride）. 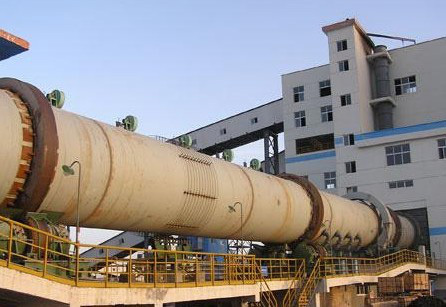 The calcium aluminate rotary kiln from Handa Heavy Industry features in advanced design, stable quality, low operation cost, energy saving, high efficiency, large productivity, low pollution and convenient repairing and maintenance. We also provide services like installation and commissioning, technical support and training.